Important Comments: This antibody is expected to recognize both reported isoforms (NP_001521.1; NP_851397.1). 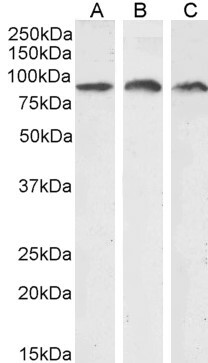 This antibody is NOT expected to cross-react with EPAS1 (GeneID 2034). Peptide with sequence C-KMTQLFTKVESED, from the internal region of the protein sequence according to NP_001521.1; NP_851397.1. Western blot: Approx 90kDa band observed in Human and Mouse Lung and in Human Kidney lysates and approx 85-90kDa in Human Gastrointestinal cancer lysates (calculated MW of 92.7kDa according to Human NP_001521.1, 82.7kDa according to Human NP_851397.1 and 93.7kDa according to Mouse NP_001300848.1). Recommended concentration: 0.3-1µg/ml. Primary incubation 1 hour at room temperature.